Each prespaced one-piece vinyl sticker is approximately 2.5 inches tall. DODGE is over 18.25 inches wide and 4x4 is about 11 inches wide. These decals are NOT OEM factory decals. They are custom made measured to originals. 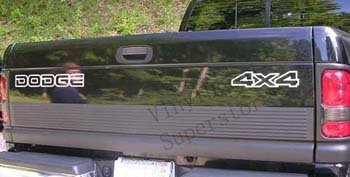 They are made of automotive grade vinyl that will not fade.